Subtle curves in the legs and three back slats make this Shaker-style dining chair both ergonomic and beautiful. Seat Height - 24" or 30"
Customize your chair with options in our drop-down boxes (shown top right). The Alana exudes the refined elegance of an upholstered dining room chair. This handmade dining chair comes in your choice of design and accessories. This Mission-style dining chair has four back slats curved just enough for comfort, visible dowels securing the plain and simple end cap, and straight legs. Sophisticated and elegant, the Carson dining chair is perfect for the regal dining room. Typical of the Queen Anne style, the Carson dining room chair has curving and elegant lines, featured in the back of the chair. Available with or without arm rests, the Carson dining chair is made out of solid, mocha colored wood. Pair these with an elegant or Queen Anne style dining room and your dining room will look perfect! Pictured in brown maple with Michael's Cherry stain. Seating - 20" x 17½"
The Armani dining chair is perfect for the modern yet classically styled home. The Mission-styled chairs feature geometric and simple lines that complement any dining room. True to its name, this chair is just a bit artsy without all the fuss. With high, contoured backs, contoured seats and optional arm rests, the Arts and Crafts chair is designed with your guests’ comfort in mind. The Aspen Chair is an exceptionally built piece of furniture. Built to high quality Amish standards, you will be proud to keep this in your family for generations. The solid construction and impeccable detail will be second to no other piece of heirloom furniture on the market. Amish hand crafted with 100% fine hardwoods. This traditional style chair would fit into a country home or an elegant city townhouse. The chair's back has a design that is beautiful without looking fussy. The dark, robust color of the chair balances with the graceful design for a sophisticated piece. Pictured in a custom two tone finish. Custom finishes need to be ordered by phone. Pictured in brown maple with seat in Michael's Cherry stain and base in Rich Tobacco stain; a custom two tone finish. Custom finishes need to be ordered by phone. The Bayfield Dining Chair is elegant and has a comfortable upholstered back as well as the seat. The Bayhill Chair features elegant Mission slats and a handle built into the end cap. Built to high quality Amish standards. You will be proud to keep this in your family for generations. Built to last by Amish master craftsmen with 100% hard wood. Customize your stool with options in our drop-down boxes (shown top right). The Bayridge is a traditional-style dining chair with cabriole front legs and a curved back frame. The back slats consist of four narrow slats and a broader central splat; they follow more distinct curves than the frame, creating a uniquely dimensional heirloom chair. You put your trust in a chair every time you sit on it. Amish dining chairs are built strong. All of our cherry or oak dining room chairs are 100% hardwood and handcrafted to heirloom quality standards. The joints are mortise and tenon joinery—one piece fits inside another in a shape that holds the maximum possible amount of glue. Our chair bases are reinforced under the seats with hidden corbels. Some chair bases have trestles between the legs for style and strength. In addition to the variety of styles, like Mission style dining chairs and more, Amish dining chairs come with virtually unlimited options. Choose between arm chairs with arm rests or side chairs without. Choose from a variety of seat contours and fabric or leather upholstery. Some chairs come fully upholstered. Chair bases can be modified to turn almost any dining chair into a desk chair or bar stool: add a gas lift, swivel seat, or extra height. To add that finishing touch to your dining room, chairs can be custom-finished with a two-tone finish or burnished edges. Selecting wood and stain at the same time is a beautiful experience of textures and colors. Combine cherry, oak, or any texture of woodgrain with dozens of stains and paints for these dining room chairs. 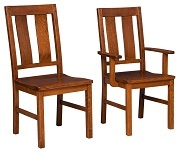 Our Amish dining chairs are made in the USA from North American hardwood. You, your guests and your family can rely on these chairs for a comfortable dining experience.